Here is an interesting procedure to inset, insert, or superimpose, a photo on another. This is certainly not the best, or easiest way, but it can be quick and handy. Photo editing programs are the way to do this. 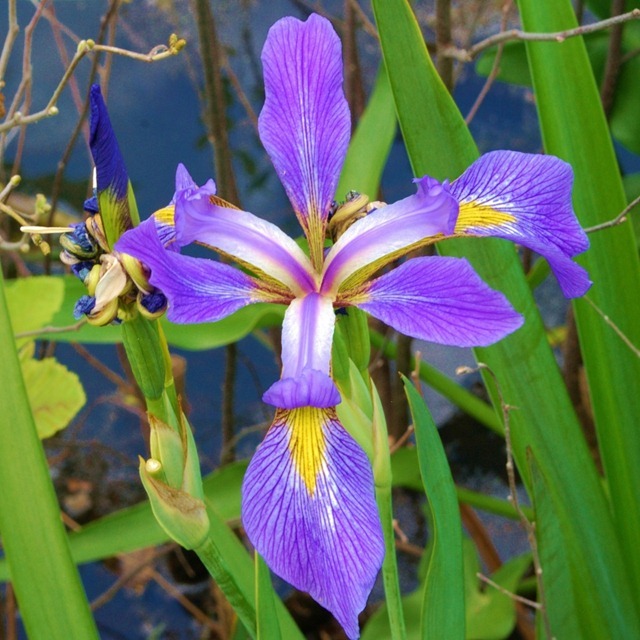 There is a better way using Picasa, see my post How do I superimpose a photo on another one? 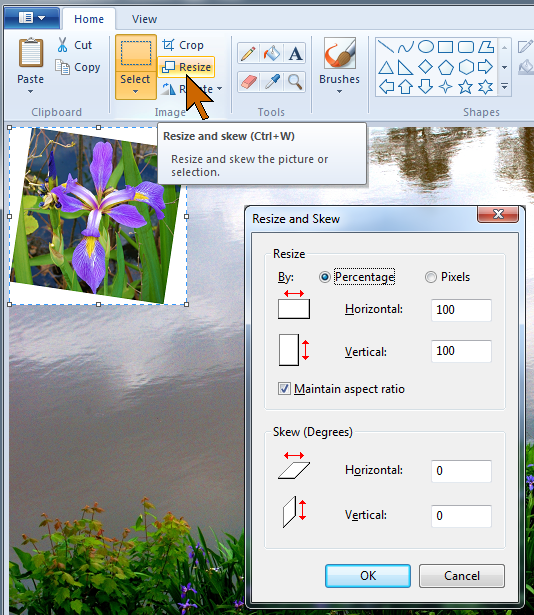 Windows Live Photo Gallery does not provide for such a task, but when a photo is opened in Paint other images can be easily pasted in. Take these two photos. 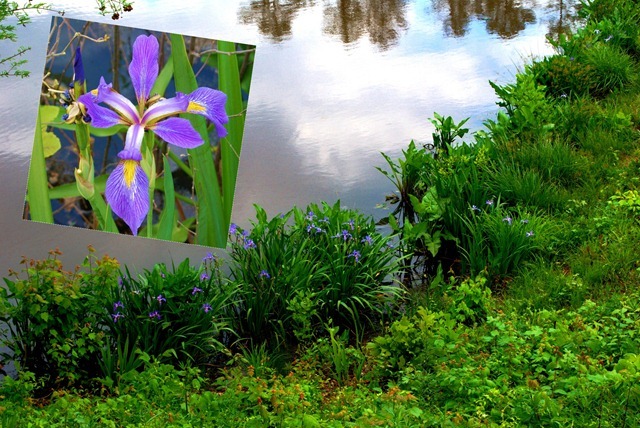 The detail image of the water iris is to be added to the scenic pond photo. We want the inset to be at an angle. So how does one add this twist? Open the “base” picture in Paint. 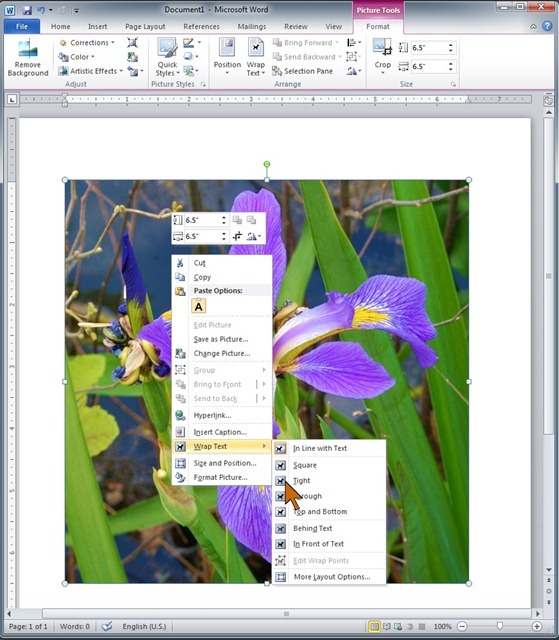 Open Office Word 2010 and insert the second photo. 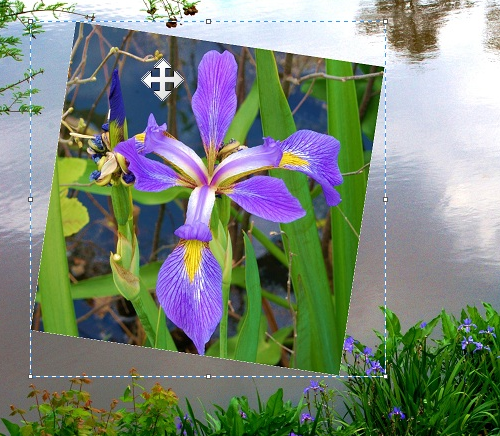 The Picture Tools, effective when the inserted photo is clicked, offer a wide range of tools, effects, and options. To allow moving the inserted photo around on the page, right-click on it, select Wrap Text and in the right menu click Tight. With the picture selected, there is a “rotate” handle sticking out at the top. You can see it in the illustrations here. When you move the pointer to the little colored circle a curved arrow will wrap around the tip of the pointer. This tells you that the rotate function is available. Move the pointer left or right to rotate the picture. When you have the rotation the way you like it, release the mouse button. Press Ctrl+C to copy the rotated image. Now go to Paint with the base photo. You may need to change the View so you can see all of the photo. Click the Home tab and click Paste – or just press Ctrl+V. The pasted photo will be in the upper left corner. It likely will not be the size that you like. No problem. Just be careful not to click anywhere in the picture area. Click Resize. 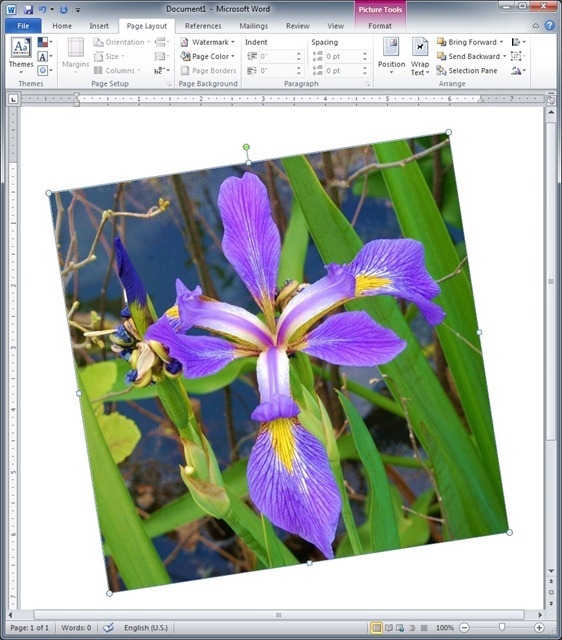 In the Resize dialog you can change the size of the inserted photo either by percentage – up or down, or by actual pixel dimensions. The illustration here shows the details. No need to worry about the white area around the titled image just yet. Just get it to the right size first. Next click on the down-pointing arrowhead below Select. 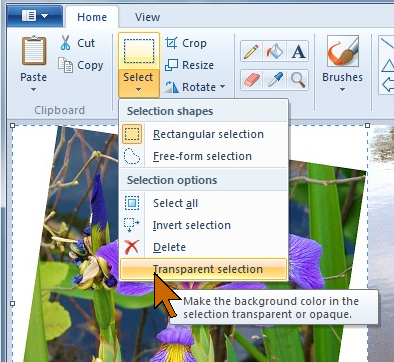 Click on Transparent selection. the white areas will now be transparent. Move the pointer over the inserted photo. It will change to the four-pointed drag icon and you can drag the photo around to position it exactly where you want it to be. All this will take less time than you spent reading about it here. Naturally, you can add more than one inset image using this procedure. When you have completed the process, be sure to save your new photo with “Save as” so you will not overwrite the original photo. By the way, the properties, or EXIF data, of the base photo will be retained in the composite. Not, of course, any information from the inserted images. 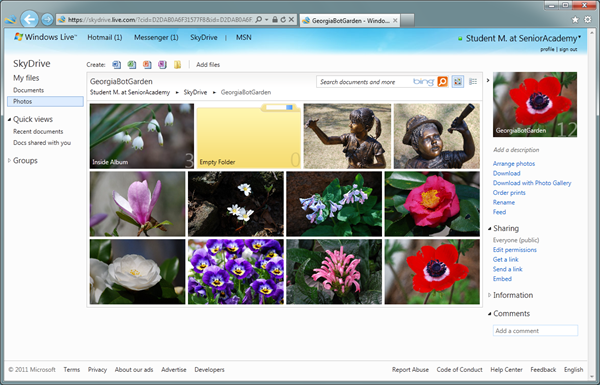 With your photos stored and arranged in Windows Live SkyDrive the next step is to share your memories and treasures. SkyDrive is not al all like so many other photo sharing sites that are the equivalent of galleries or museums for visitors from far and wide. For example, Flickr lets you explore photos from artists around the world. 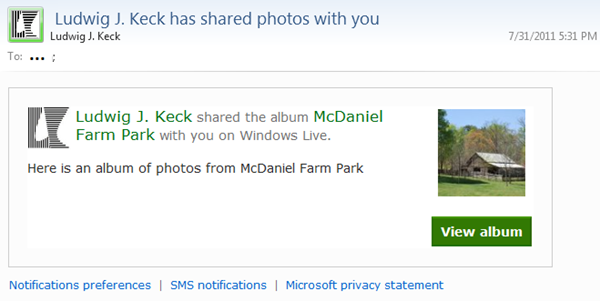 While flickr.com/ludwigkeck gets you to my photos on Flickr, there is no equivalent address for SkyDrive. 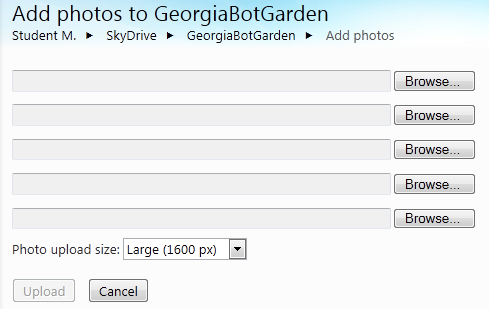 SkyDrive is a very private place, there is no easily memorized address to your gallery. You can specify who can see your photos in great detail, yet sharing requires action on your part. You must invite your friends to come and see your photos. You do this for albums, not individual photos. In your album view there is a Sharing section in the information pane on the right. It shows who the album is shared with, in the illustration here that is Everyone (public). 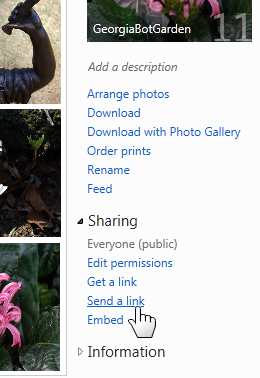 There are three links for initiating sharing: Get a link, Send a link, and Embed. The most straightforward is Send a link. Click Send a link and the next page provides a form for sending an email. The email your friends receive identifies you and the album you are sharing. It includes the message that you specified. There is a thumbnail of your “cover” photo and a link “View album”. 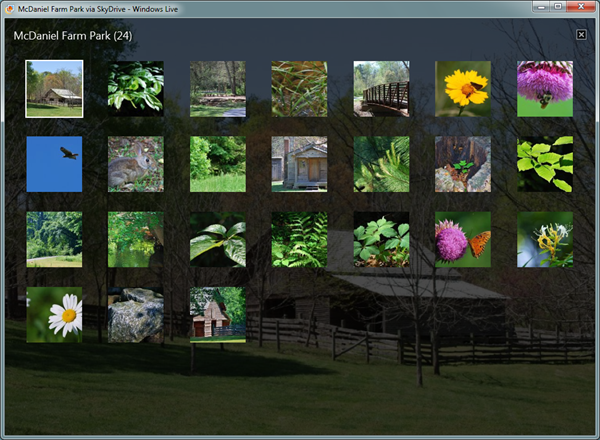 Full screen, of course, provides a screen-filling view of your photos. Thumbnail view is a gorgeous display of the thumbnails over a darkened image of the photo being shown. 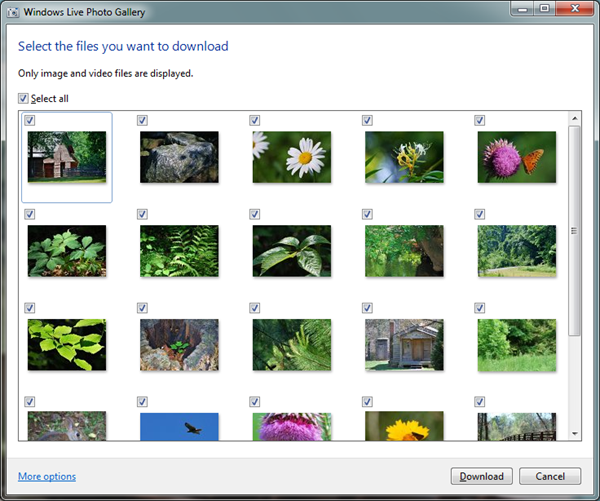 Clicking Download brings up the Windows Live Photo Gallery import dialog. The recipient can select just the photos to download. On opening, all the thumbnails of the photos in the album are checked. Making a customized selection is straightforward. The download process takes a bit of time, as you would expect. 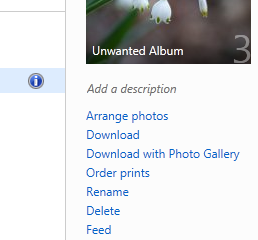 Now how does a recipient see the album if he or she does not have Windows Live Photo Gallery installed? The link in the email will take them to the album using the default browser. This looks just as it does when you are signed in to your Windows Live account except that the visitor does not have links for making changes to the album or SkyDrive. The Get a link command opens a page that displays a text box with an URL. The message says: Copy this link to share. You can click the word Copy or click in the text box and press Ctrl+C. The link is placed on your clipboard and you can then paste it into an email. The URL is way to long to copy by hand. This link takes the recipient to the album in a browser. The third sharing option is Embed. This also takes you to a page with the information. In this case the text box contains HTML code. The headline says “Embed … in a blog or other webpage”. Unfortunately the code specifies an “iframe”. This code style is not recommended, and in fact not allowed on some blog sites. For example, if uploaded to a WordPress.com blog, the code will get stripped out. So for many, this code is next to useless. My recommendation is to not use this. When you give someone access to one of your SkyDrive albums, you are in effect giving them access to all your public folders and other folders shared at the same sharing level. That little arrow in a circle in the upper left of your photo presentation allows your visitor to go to album view. The path to the album is shown and allows the visitor to click on any path item. And hence to any other public folder. Obviously public folders are there for visitors, but do keep this in mind. 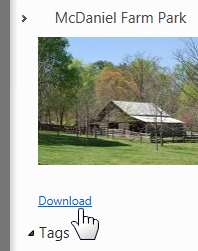 In “SkyDrive view” when viewing a photo, the information pane shows a Download link. 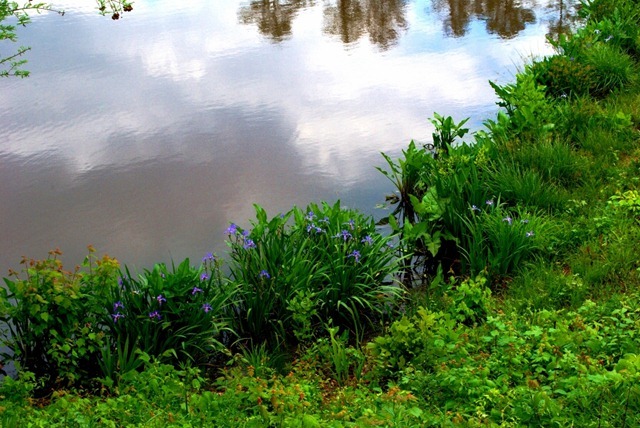 This link initiates a download of the photo. The download is done to the folder where downloads are normally stored. In album view, where all the thumbnails are displayed, the info pane on the right, shows additional options (shown here on the left). 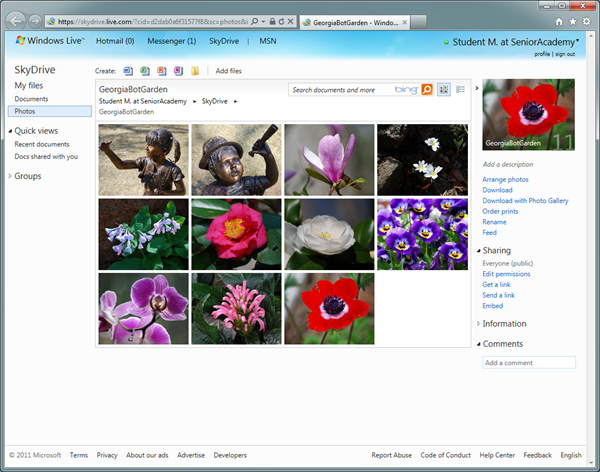 The link “Download with Photo Gallery”, works as described above, allowing your email recipient to select which photos to download. The Download link runs the normal file downloader. See the illustration here. Note that the album will be downloaded as a compressed ZIP file. If there are any sub-albums in the album, they will be included in the zip file. Your friends can enjoy your photos as long as they keep your notification email. SkyDrive is not like a public gallery, more like an attic in your house and your guests are not totally free to come and go. That is the nature of SkyDrive. 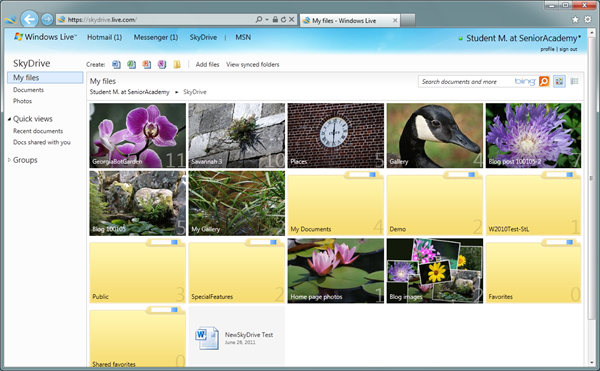 Organizing your photos is an important part of getting your SkyDrive albums just right to show of your work. This means creating albums, moving photos from one album to another and re-arranging the order of the pictures inside an album. With the many recent updates to SkyDrive the methods and tools for these tasks have changed, so here is a review of these procedures. Albums in SkyDrive should preferably be arranged in a “flat” hierarchy – no albums inside albums. 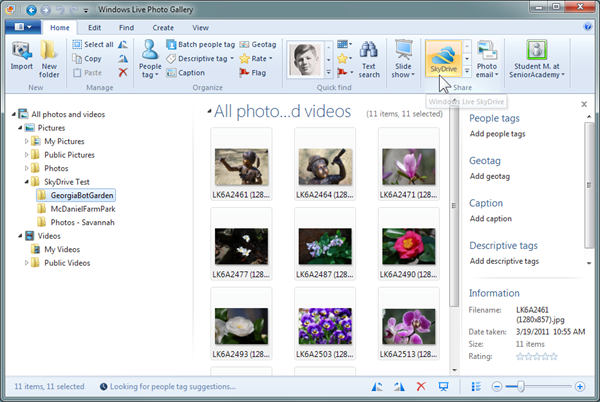 Although putting an album inside another is easily done, you cannot upload from Windows Live Photo Gallery to an album that is inside another. The sharing settings of an album will also apply to any sub-albums inside, this might not be what you want. When viewing photos you can step only through the pictures in the current album, there will be no indication that a sub-album is available. That said, albums inside albums will show slide shows of their photos on their tiles – charming to say the least. You create an album in SkyDrive that is located in the current album of folder. 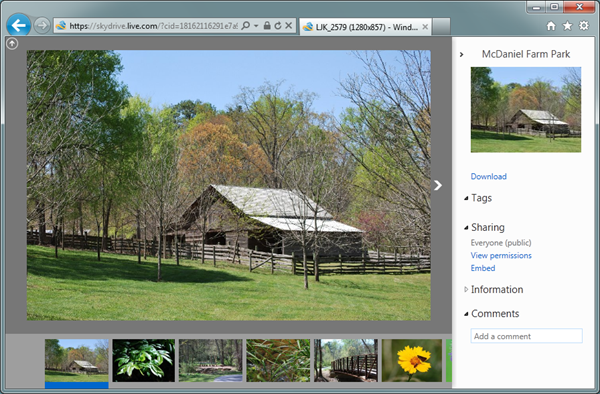 See Photos and Albums in the New SkyDrive – uploading for details on creating an album and uploading photos. 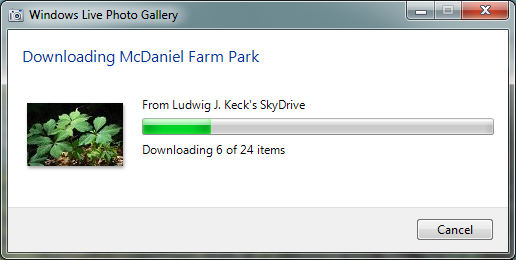 Moving photos from one album to another in SkyDrive is fairly easy for one photo. Unfortunately, there is no way to select multiple photos to be moved, so the procedure has to be repeated. Click on a photo you wish to move, it will be shown large. If you don’t see the info pane on the right, click on the left-pointing arrow in the upper right. In the info pane are a number of links. To move a photo to another album, click Move. If you wish to copy a photo to another album, so that you will have the photo in the current album as well as in the destination album, click Copy. The remainder of the procedure is the same for moving or copying. The next page presents a list of all the folders and albums on your SkyDrive. Click on the destination album. If that album contains more albums, you will see them on the next page. Note the choices: Move this file into …, New Album, and if there are additional albums they will also be shown. You can create a new album at this step. Click the Move this file … (or Copy this file …) when the desired album name is shown. After a short delay, while the action is performed, the destination album will be opened. Above the thumbnails you can see a message describing the action just performed. You can also see the path of the current album. 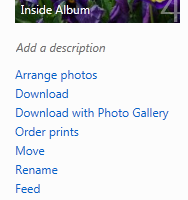 Click on the a album name in the path or SkyDrive to get to another album. You can move albums around just like photos. In album view, when thumbnails or the contents list are displayed, the info pane offers a Move command. This works just like the move process for a photo, except that the entire album can be moved to another album. You cannot copy an album – something not normally needed anyway. NOTE: This is not available for primary albums, only for albums inside albums. Note that there is also a Rename command to change the name of an album. 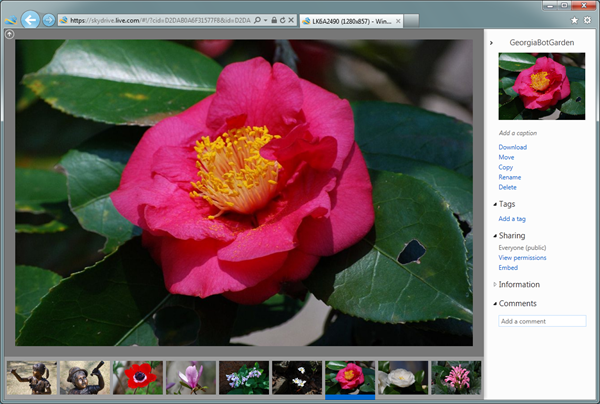 When a photo is displayed by itself, the info pane also offers a Delete command. This works just as you would expect. A delete confirmation is required, there will be a message dialog about like shown here. It advises that you are about to permanently delete an item from your SkyDrive and you have the option to click OK or Cancel. When in album view showing thumbnails there is not a delete command option in the info pane. I have wondered if this is intentional or an oversight. The procedure for deleting an album requires an couple of additional steps. Above the thumbnails in the upper right area, there are a couple of icons, one offers Thumbnail view, the other Details view. Click the Details view icon. You are now presented with a list of the contents of the present album (or SkyDrive). Move the pointer to the album that you wish to delete. While the pointer is on the item line, to the right of the entry there is a “Show information” icon, . Click this icon. The info panel will provide information for this album and also include a Delete command. You may wish to arrange the photos into a particular order. In SkyDrive is is easily accomplished. Any time you are in an album the info pane includes an Arrange photos command. If you have Silverlight installed and are using the 32-bit Internet Explorer or another browser, a very neat drag-and-drop method is available. With the pointer over the thumbnail you wish to relocate, just press down on the left mouse button and drag the thumbnail to the desired location. Note how the thumbnails move apart to make room for the newcomer. The thumbnail in the original position will fade out. There is another method. It is the only one with 64-bit Internet Explorer or if Silverlight is not installed. It may also be the only method by the time you read this, as continuing changes to SkyDrive are released. You can also bring up this alternate method by clicking “standard arrange photos page”. This method may seem complicated at first view. Each thumbnail has a number and you need to renumber the order. It is easier that it appears. The instructions are to number the photos in the order you’d like them to appear in your album. Note the number of the photo where you want to place another photo. Then replace the number in the number box of the photo to be moved – it is a plain text box, you know how to replace and type text. In the illustration here, I want photo 6 in place of photo 5. So I enter 5 in the box of photo 6. Press Enter and the photo instantly is relocated and the thumbnails are renumbered. The procedure is not as pleasant as drag-and-drop, but just about as fast. After the thumbnails are in the order you like, click Save. SkyDrive is a bit different in the way things work, but after some practice you will be proficient in organizing your photos so you can show them proudly. 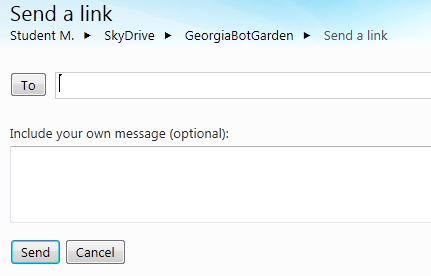 Many changes have been made to SkyDrive and the way you use it. Instead of rolling out a new version, updates have been released piecemeal and more can be expected. 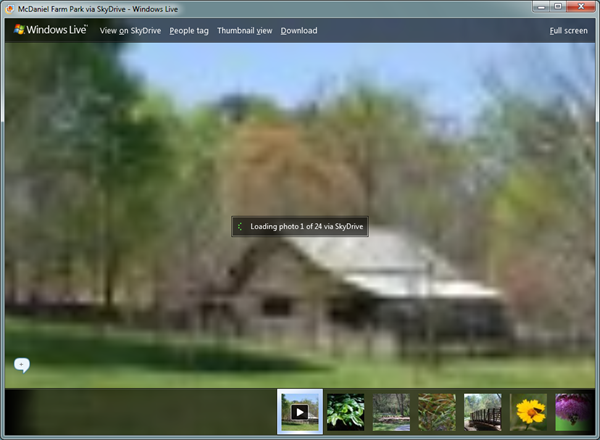 This article reviews how to use SkyDrive for your photos as it works in August 2011. 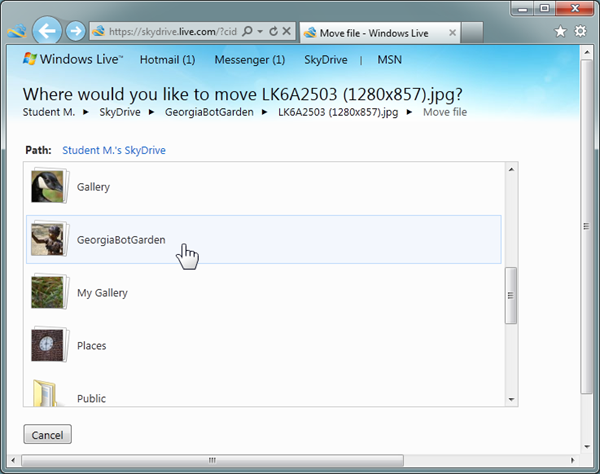 There are two ways to upload photos to your Windows Live SkyDrive: From SkyDrive – I call that pulling up, and from Windows Live Photo Gallery – my term is pushing up. Even signing in has changed, so let’s start there. 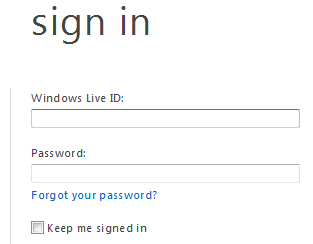 When you go to home.live.com there is standard sign in with text boxes for your Windows Live ID and password. No longer can you select an ID from several choices. There is a “Keep me signed in” check box so you will be signed in automatically next time you open your browser. On your Windows Live Home page the menu bar now includes SkyDrive. The drop-down menu offers choices for Documents, Photos and more. You can just click on SkyDrive and it takes you to a view of all of your contents. The contents may be shown as a list of “tiles” – small thumbnails. Tiles of photo albums play slide shows of the contents. As the illustration here shows, document folders are depicted as folders. Each tile also shows the name of the folder or album. Click on an album tile to open the album. It still is not possible to upload a folder with contents. You create an album or a folder by clicking the little folder icon above the contents listing. 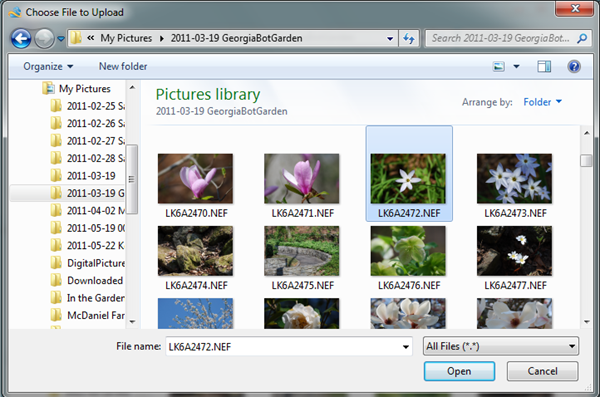 To add photos, navigate to the folder where you wish to add files and click Add files. If you have Silverlight installed a page opens that invites you to drop photos into the folder. This works beautifully. Open Windows Explorer to the pictures folder you want to upload. In Windows 7 you can clip Windows Explorer to one edge and the browser to the other and just drag the thumbnails from one to the other. You can select multiple photos and drag the “pile” over. Note that there is a size control option in the upper right of the folder page. The default upload size is 1600 pixels (max dimension). You can also specify that the photos are uploaded in their Original size or a small size called Medium (600px). Upload actually starts when you drop the thumbnails. Once your selection is complete click Continue and allow the process to finish. When a Browse button is clicked a “Choose File to Upload” dialog opens. Unfortunately, only one file can be selected at a time, so you have to go through this multiple times. 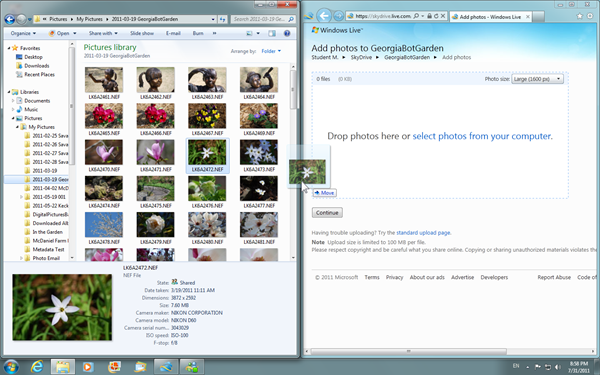 A much easier way to upload is the other method which uploads photos from Windows Live Photo Gallery. You do not need the browser open, but it works best when you have selected “Keep me signed in”. Similarly you should sign in to Photo Gallery – this too is “sticky” and you will not need to do it each time. Select the photos you wish to upload. Remember that Ctrl+A will select all the photos being displayed. Then click on the SkyDrive icon in the Share group of the Ribbon (Home tab). Caution: Be sure that you have selected just the local folder from which you wish to upload. 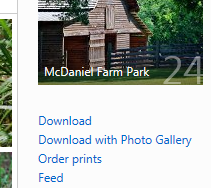 You can inadvertently select photos from multiple folders and they will wind up in just one SkyDrive album. 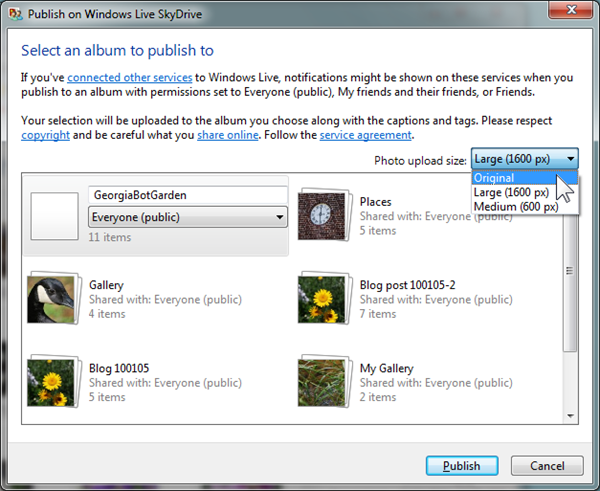 A “Publish on Windows Live SkyDrive” dialog allows you to select the destination album. The first choice allows you to create a new album. You can specify who can see your photos in a new album. The default is Everyone (public). As with the other method, you can specify that the process resizes your photos or uploads in the original size. Click Publish to start the actual upload process. 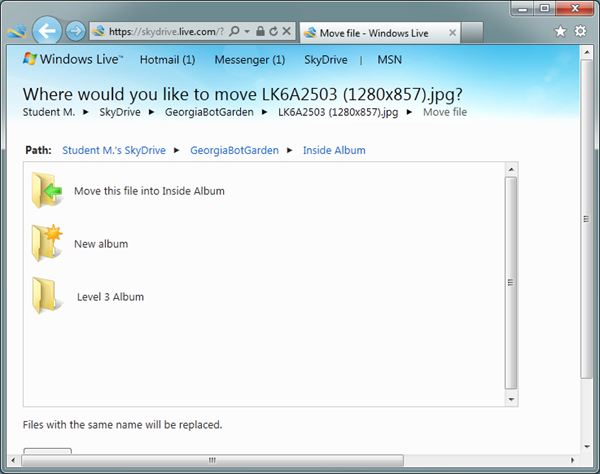 On completion you will be offered to view the SkyDrive album. 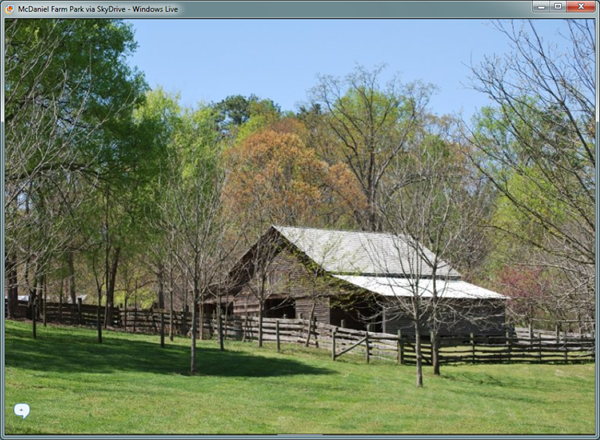 Did you know that you can clip your SkyDrive to your Windows 7 taskbar? Drag the little SkyDrive icon that shows in front of the URL in your browser down to the taskbar and release. You can also release it on your desktop for a shortcut. With SkyDrive on your taskbar it is just one click away.